Oh July, so much to celebrate, not least the, almost, unending sunshine. We could get used to this, given the chance. Here are some happy memories from the past 4 weeks - all taken on my phone. This is my second month of creating a gratitude collage and I'm enjoying the process of wrapping up each month by reflecting on it. ♥ I spent a wonderfully exciting but tiring day in London with my 15 year old son. We visited The British Museum, popped into the new Peddlars General Store and Cafe and had tea with my brother in St. Albans. ♥ So we did have some rain as I captured this rainbow on my phone. ♥ Pimm's to celebrate my dad's 78th birthday. ♥ Pavlova to celebrate my father-in-law's 70th. ♥ I bought some eighties shorts from a vintage shop to replace the denim ones I sold at last month's car boot. These are so cool and comfy. ♥ Hubs and band nailing it at our local festival Fuse. Very proud of him. ♥ Beetroot and feta salad a new recipe which I'll make over and over again, I'm sure (I left out the spring onions though). ♥ 22 hearts for our 22nd wedding anniversary. ♥ Verbena bonariensis at Baddesley Clinton, a National Trust property in Warwickshire. This is a new plant to us and is looking stunning right now in our tiny garden too. So many lovely moments in your month, great collage. My eyes are on the pavlova - and I can't seem to take them off. 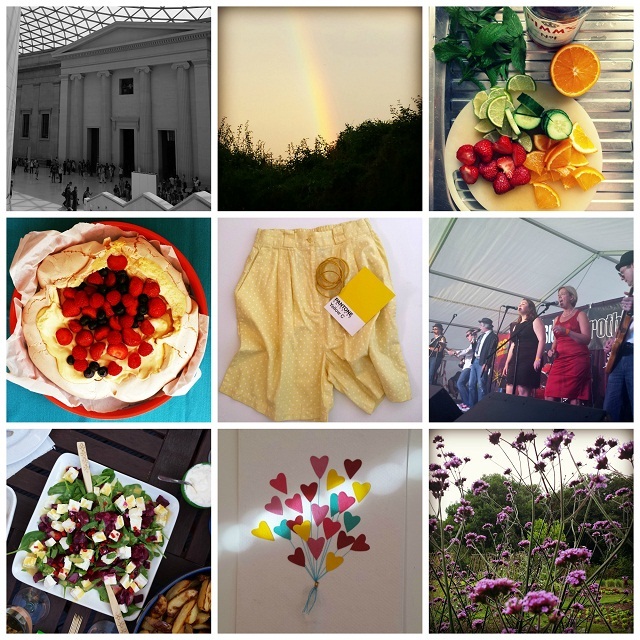 I love your photo collage idea--what a colorful and vibrant month you had! Happy Anniversary to you (the hearts idea is lovely, too!). Minimalist Monday: Is a Simpler Life Attainable?